How can learning in the Ugandan rural water supply sector be conceptualised and modelled? As I am halfway through writing my thesis I’d like to discuss why ‘learning’ in the question above actually does not refer to learning as it is commonly understood and what possible answers the field of memetics may offer to the question. When we analyse a system we have information about the current state of the system. The future state of a system, however, is difficult to predict. We do not know what events will occur and what their impact will be. When we make predictions over longer time horizons, we are even less certain. Most people do not like uncertainty. We can formulate two strategies: 1) Predict the future state really well and 2) take uncertainty as ‘a given’ and adapt the structures in the system. In adaptive management, the cycles of policymaking are shorter and policies are used to test hypotheses about the behaviour of the system. Good policies are adapted and scaled up, others are rejected, and new ones are tested. Organisations in the sector that are able to ‘learn’ better contribute to the adaptiveness of the sector. If an organisation is able to quickly learn the effects of their actions, the policy cycles in the system are assumed to get shorter. an organisation can learn from another organisation what actions to take. A visualisation of a water system is shown in the picture below. We can distinguish between a technical and a social system. In a technical system, a water infrastructure provides services to people. 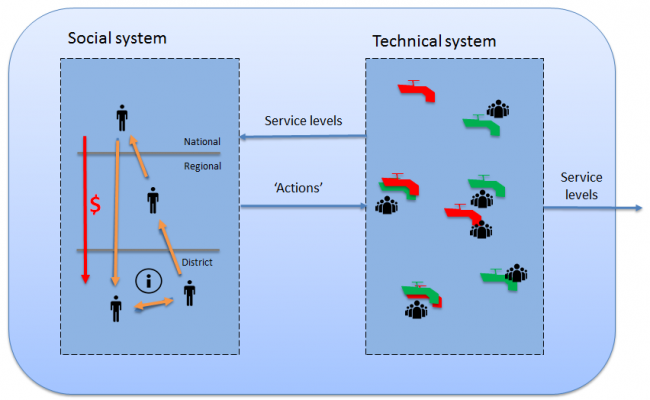 In a social system, we can observe a multi-level governance situation where interactions between organisations at different institutional levels lead to decisions about the water infrastructure – for instance installing a new water infrastructure or repairing a broken infrastructure. This perspective is applied to a case study in the rural water sector in Uganda. The case looks into financial allocation from the national government to district governments. The districts use the budget to invest in water infrastructure. In this case, the districts can learn how best to spend the budget. They can learn this by themselves, by reflecting on the actions they perform, but in the thesis, I am more interested in how they learn from each other. In practice, there are two ways that districts can learn from each other. The first is via (annual) inter-district meetings. And the second is that a regional party identifies a well-performing district. They bring the district’s strategy to the attention of the national government which in turn can apply the strategy in other districts. An example of this is the Hand Pump Mechanics’ experiment. I want to analyse how information is disseminated through the system and when it is used by other districts as a proxy for ‘learning’. What do district governments learn from each other? National government dictates what the districts spend their budget on. For instance, at least 70% must be spent on new infrastructure and only a maximum of 13% may be spent on major maintenance. There are more budget allocation restrictions, but for the simplicity of the argument, we will stick to these two. The district has some room for manoeuvre in the final allocation ratio. Districts can learn from each other how to adapt the allocation ratio successfully. Next, to budget for new infrastructure and budget for major repairs, a third factor is added to the ratio: the unspent budget. In practice, money that isn’t spent at the end of the financial year has to be returned to national government. Delays in projects are a major cause for the unspent budget. How and when do district governments learn from each other? If a certain allocation ratio results in relatively high water service levels in a district, this ratio is considered a ‘good’ or ‘effective’ ratio. Consequently, a ratio can be considered ‘poor’ or ‘ineffective’ when it results in low water service levels in a district. We assume that districts with poor performance only want to learn how to spend the budget from a district with good performance. The process of determining ‘good’ and ‘poor’ ratios is called selection in the field of memetics. Memetics describes the evolution of ideas or information. Memetics has its roots in genetics, the evolution of living organisms, but is used to describe how information is transferred between people and how the information evolves over time. In this case, the information that is transferred is the allocation ratio. I use the theory of memetics in this study because it provides a theory with clear process steps that describe how information evolves through a social system: selection, replication and variation. Selection: in genetics, a portion of DNA is replicated and varied. The offspring, be it a human or a lizard, can survive and reproduce based on the characteristics provided through the DNA. The offspring with the good DNA survives (or it is just lucky) – this is the process of selection in genetics. The process is repeated over and over again. The process of selection of ‘good’ information is similar: a good allocation ratio is a ratio that provides high water service levels in a district. The ratio ‘survives’ because it is used again in the next year. A ratio that results in poor performance ‘dies’, because no district wants to use a ratio that proved to deliver low service levels. Replication and variation: I am interested to see if different scenarios for replication and variation of an allocation ratio result in a different performance of the whole water system. For instance: can we observe different behaviours of the system when districts can learn from all other districts in the country than when districts only communicate with the districts in their region? And is the system performing better when districts just copy a ‘good’ ratio as opposed to slightly adjusting the ratio? In this blog, I showed that rather than ‘learning’ in the conventional sense, i.e. new skills, ideas, or textbook/school-based learning, this research is focussed on exploring the effects of different ways in which a policy – the allocation ratio – can evolve through collaboration in a social system. After the completion of the research, I hope to be able to provide insights into how different scenarios for selection, replication and variation can drive, or possibly hamper the spread of policies. Furthermore, I will reflect on the value of using memetics to conceptualise the interactions between different parties in the water sector. For now, the next step is to make numerous simulations in an Agent-Based Model. This allows exploration of the described scenarios. When performed well, policymakers in the sector will be able to probe the results their choices can have over a long period of time and thereby reflect on what policies would better stimulate the spread of information in the sector. And not only that, this work also allows us to understand much better how to identify ‘information’ and to understand what information is transferred. This understanding can be extrapolated to other (water) sectors to, for instance, set up learning forums at the right institutional level.